Home Rifles ARs Are You Shooting The Best AR-15 Ammo Possible? Accuracy is subjective. What might work fine for self-defense may not provide the accuracy necessary to place a surgical shot at 100 yards. Think about your application, then don’t get too caught up in how tight a group your AR can shoot. Most of them shoot much better than we’re capable of as shooters. Are You Shooting The Best AR-15 Ammo Possible? Your ammo choice is more important than what you attach to your quad rail. Choosing ammunition for your AR is as important as every other gear consideration. You have to feed the machine in order for it to function properly — and “properly” starts with reliability. Accuracy, which becomes more critical as distance increases, is another consideration. For defeating a violent attacker, the round has to stop the threat as efficiently as possible. And let’s face it: The AR fires a small round, and the smaller the round, the more critical ammunition becomes. Choosing ammo starts with identifying how your AR-15 is configured. Start by determining what chamber your AR has. There are three type chambers you’ll come across — discounting aftermarket variations like the .300, 6.8 and 7.62 versions. AR-15s come with a .223 Rem. chamber, a 5.56 NATO chamber and the .223 Wylde chamber, and they’re all slightly different. You can fire .223 Rem. ammo in the 5.56 and Wylde chamber. And, 5.56 ammo can be used in a Wylde chamber. But never shoot 5.56 ammo through a .223 Rem. chamber. Chamber size is usually stamped in the barrel, along with twist rate, but if you’re unsure, contact the manufacturer to confirm. What type feed ramps does your AR have? The feed ramps are located at the end of the barrel extension and guide the bullet into the chamber. Older ARs usually have “rifle” ramps that don’t extend down into the upper receiver. Newer ARs have M4 ramps. These are cuts machined in the upper receiver that lengthens the ramps to ensure feeding of longer bullets into the chamber. With M4 ramps, there shouldn’t be any problem with any bullet type you choose to shoot. Some older rifle ramps, however, will have problems with different types of bullet tips, such as soft points. Just be sure to test fire enough ammo to ensure it feeds in your weapon — every time. Hi Power or High Power: What’s in a Name? In addition, I use brass-case ammo almost exclusively. The AR was not designed to cycle steel-case ammo, so if you choose to shoot it, you’ll need to keep an eye on a few things: Clean the barrel and chamber more often. The receiver on the left is cut for M4 feed ramps. This provides a smoother transition for the round to feed from the magazine into the chamber. At right, the receiver is a “rifle” receiver, or older-style AR. This design can cause feeding problems with some types of ammo. Steel doesn’t expand as much or as fast as brass, so there’s more blowback of powder residue and carbon into the chamber. And if the chamber becomes too tight due to residue, cases start sticking. This is especially true if you switch to brass-case ammo after shooting a lot of steel-case rounds. Steel is also rougher on the extractor than brass, so inspect it and the extractor spring regularly, which you should do anyway. Most steel-case ammo is loaded with a bullet featuring a steel jacket with some sort of thin copper coating over the steel. There’s a big debate on whether steel-jacketed bullets are harmful to the barrel or not. I think they do harm the barrel. An average shooter may not have a problem, but a full-time shooter will shorten their barrel life by about 50 percent, from around 10,000 rounds down to 5,000 or so. During classes, I see more function problems with steel ammo than with brass rounds because steel-case ammo can cause additional feeding problems by binding up in the magazine — it’s not very slippery. My advice: If you’re spending a lot of time and money on a shooting trip, take brass-case, high-quality ammo. And no matter what, always test-fire enough of any ammo to make sure it functions properly in your gun. After you’ve selected a round, you’ll need to test-fire it for function. When you’re at the range, inspect each round prior to loading it in a mag. Ammo companies are running high production rates, and increased production means more faulty rounds. Physically and visually inspect each round before jamming it into your mag. There’s no reason your AR should not be reliable. Keep it well lubed, clean as necessary and feed it the right ammo, and it will serve you well. If you try to run questionable ammunition through your gun, you’re going to see problems. For plinking on the range, this might not be an issue, although I can’t abide it. When shooting in a match, for hunting or for personal defense — life and death — a stoppage due to faulty ammo is unacceptable. Good ammo ensures you hit the target time after time. There is a variety of ammo available for the AR. You can easily identify the type of tip the bullet has, but to know the rest of the details — including bullet style, weight and length — you’ll have to check the manufacturer’s specs. The definition of accuracy is very subjective. For precision shooters, accuracy is hitting the target at hundreds of yards. For many military applications, it doesn’t really matter where you hit them, as long as you hit them — though precision is always best of course. A sniper needs pinpoint, surgical accuracy. For defensive purposes, things are going to be a lot closer, usually “handgun” distances. So, the question becomes, “How much accuracy do you need?” For self-defense, a round that will hold 1 to 2 minutes of angle is more than suitable. One of the big considerations is the twist rate of your barrel. Heavier bullets, which are longer, require a faster twist rate. The original 55-grain M193 round worked well with a 1:12 twist rate. As bullets began to get heavier and longer, the twist rate increased. Today 1:7, 1:8 and 1:9 twist rates are the norm, and each will stabilize heavier, longer bullets that weigh 60 grains or more. Manufacturers invest a lot of research and study into designing, testing and constructing a round for defensive purposes, and the various departments and agencies on the ground will research, study and test when choosing their duty ammo. Selecting ammunition for self-defense is just as serious. Self-defense ammo must stop the threat efficiently, transferring its energy into the body. The better the round dumps its energy into the body, the less chance of over-penetrating and passing through the threat. I still like the original M193 55-grain full metal jacket round: It tumbles and fragments in the body, creating multiple wound channels. Just be careful when purchasing it. True M193 has an exposed lead base at the back of the bullet, hence the “explosive” results. Due to environmental concerns, a lot of companies make a “M193” round, but with a copper jacket that covers the entire bullet — including the base — in order to reduce the shooter to lead exposure created by that round as it’s fired. This completely changes the dynamics of the round, and it doesn’t perform the same as the exposed-base design. Steel-case “ball” ammo should never be used for self-defense, unless it’s “the end of the world as we know it” and that’s all you have. Steel-jacketed rounds punch right through the threat, doing little damage — and over penetration is also a major concern. The same is true of M855 “green-tip” penetrator ammo. I’m also not a fan of soft-point rounds. Often, these will not deform, expand or tumble, leading to over penetration. Matt Weathers, Chief of Alabama’s Conservation Officers, issues his officers a 55-grain hollow-point round. He has personally had to shoot over three hundred deer in his career — putting down severely injured deer and for fetal research — with the .223/5.56 AR. This field research has shown that the 55-grain hollow-point performs best, with little chance of over penetration. For interior work, such as personal defense in the home, a 40-something-grain hollow-point reduces the chances of over penetration even more. Remember the research that departments and agencies put into choosing a duty round? Their concerns are the same as yours (military matters are completely different.) This might mean the ammunition they use is a good candidate for you, too. The ammo you choose is dictated by what you’re shooting at. Make sure the ammo fits the application — taking into account chamber size and barrel twist. Then, test for function to ensure reliability and accuracy. And then practice. After all, the purpose of shooting is to hit, and hitting the target depends on your skill. 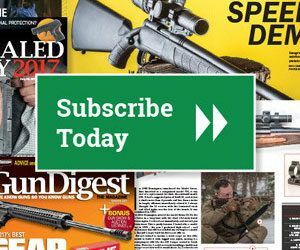 Editor’s Note: This article originally appeared in the July 2018 issue of Gun Digest the Magazine.